I think I’ve finally figured out why we love church camp. You know. The retreat that so many of us go on once or twice a year. We all bring terribly bad-for-your-health junk food, money to order pizza at midnight, and tissues to cry into when we have those heart-to-heart conversations. And more importantly, we bring our Bibles and those journals that we dust off to use once or twice a year. And with many other things, the memories are lovely things that we visit often after it’s over. And we look forward to the next one that’ll come up next year. But why do we enjoy this so much? And why is it so different than our normal lives? I’m not going to talk about the goofiness that goes on (or why we play Do You Want to Buy a Duck? After the clock turns 12:00). I’m here to talk about the fire that is sparked in our hearts. You know that feeling. You know how it feels to raise your hands in worship with sincerity. You know how it feels to regularly read your Bible and just get it. You know how it feels to enjoy listening to the chapel sessions. You know how it feels to connect with your small group after. It’s that fire that sparks in your heart after hearing compelling messages. That fire to live out your faith no matter what. But sometimes, we get home from church camp, and the fire burns out. You’re ridiculed at school because you’re viewed as intolerant. You come to the realization that you’re imperfect…and life is hard. And then there’s a lot less motivation to read your Bible, so you kind of don’t do it. 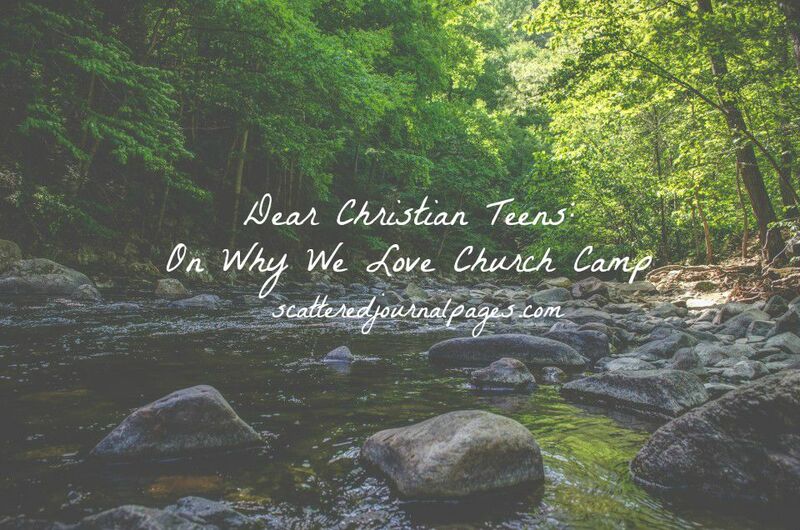 Church camp becomes just another experience, and we see it as completely separate from normal life. I think I know why we love church camp. We love it because it sparks a fire inside of us. Our faith becomes even more real to us. But seriously, when we go home, it shouldn’t end. Even though life gets harder when we aren’t surrounded completely by Christians, we can’t just give up. Jesus isn’t the Savior of Youth Group Excursions. He isn’t the Savior of Summer Camp. Jesus is the Savior of our lives, and His love isn’t any different for us when we are at camp than when we are at home. We love church camp because we feel God’s presence. We hear His voice. Things become clear to us. But that doesn’t mean that the other 51 weeks of the year need to be boring. No. Those 51 weeks can be the best weeks of the year. Wanna know why? Because we get to live it out. We get to read the Bible on our own free will. We get to pray about things in our daily life, not just out loud in front of our friends. We get to trust God in tangible ways. And we get to grow in Him, which takes much longer than five days out of state. We get to see God work things out in our lives. We love church camp because it’s a great experience and we are on fire for God. However, real life is the experience that we’ve been given for the rest of the year. Let’s take that fire in our hearts and bring it into our daily lives. For this is what we’ve been given. Let us not let our fires burn out. And if we let ourselves be under the control of the Holy Spirit, we will not burn out. You know, I’m not a Christian at all, but I do really love reading your posts 🙂 That might sound strange, but I love to learn about different faiths, and to hear people talking about their love for God, Allah, Buddha – whichever. But I especially love your posts because you’re speaking to teens. Thank you so much, Elm. It means a lot to me that you enjoy my blog, even though you’re not a Christian. I hope and pray to write in a way that lets my faith make sense to all, and not just seem like a bunch of rituals. 🙂 Thank you for commenting! Amanda, I loved this! You write with truth and eloquence. Thank you for such a beautiful reminder to never settle for just that one week of knowing God, but to spend every day of our lives in pursuit of HIm. Okay, wow. I never thought about it that way before. Just…yeah, wow. Thanks for this. Thanks, Amanda. 🙂 I’m so glad you enjoyed it. I’ve never actually been to church camp, but I can still sort of relate to this. It’s like getting fired up on Sunday morning with that great sermon, so inspired to live it all out, and then you get home and flip on the TV (or in the case of my summer, work on the basement), go back to normal life and forget about it all until Sunday rolls around again. It’s time to LIVE what we learned once we go home. Not to just think about it at church. To LIVE it. Because just knowing isn’t enough. We’re not justified by our works, we’re not saved by them (though we are saved by works, the works of Jesus Christ), but the Bible does say that we are KNOWN by our works. If the fruit we bear is apathy towards the things of God, chances are, our hearts are apathetic towards God. But if our whole lives are on fire for God, if we actively trust Him, if we actively read our Bibles, if we actively share God’s love with others, then THAT fruit shows that our heart is where our words are, that it’s not just a motivational speaker that motivates us to be close to God, that it is a lasting motivation, and it is real. Not that we won’t fail sometimes, because we absolutely will. We cannot be perfect until we get to Heaven. But even though we fail, it shows when we try. And it shows even more when we refuse to stop trying. Yes ma’am, my points exactly. We aren’t saved by our works, but when we actually think about and understand what Christ has done, and rejoice over that daily, it sure helps us live it out! Being under the control of the Holy Spirit is key. And really, this applies to anything. Church, events, camps, etc. That’s so cool, Cassie! 😀 I like that analogy — let’s stay wide awake! All in the strength of Christ. Great post Amanda! When I was at camp this year I felt really close to God the close’s I have ever felt. I would like it if would stay like that all the time! I try to stay close to God still now, I read my Bible everyday! Thank you! Exactly, and even though the music and sessions and friends won’t always be there to support you, God of the Universe wants to have a close relationship with you every day. Good for you, and stick with it! Thanks, Ellie. 🙂 It encourages me to know that it’s totally possible to have a constant close relationship with God, and that others feel this way as well! This is beautiful! The world would be a different place if we lived life the way we do at church camp! Well, aside from the junk food and… Do you want to buy a duck?? What is that?! Just the name of that cracks me up! XD We generally play Spoons or Slap Jack (both of which can be rather painful, lol, but oh so much fun!). Next PostNext I’ve Been Lied To.